The Belle of Bath was launched in May, 1877 in Bath, Maine, by Goss & Sawyer; 1418 tons; length 203.9 ft, beam 39 ft., depth 24.3 ft. She was built for Parker M. Whitmore et al. and sold to Searsport parties in 1883 for $47,500. She was destroyed by fire in June, 1897, while bound from New York to Hong Kong loaded with case oil (kerosene). The Belle of Bath was captained by William G. Nichols and Henry G. Curtis of Searsport. 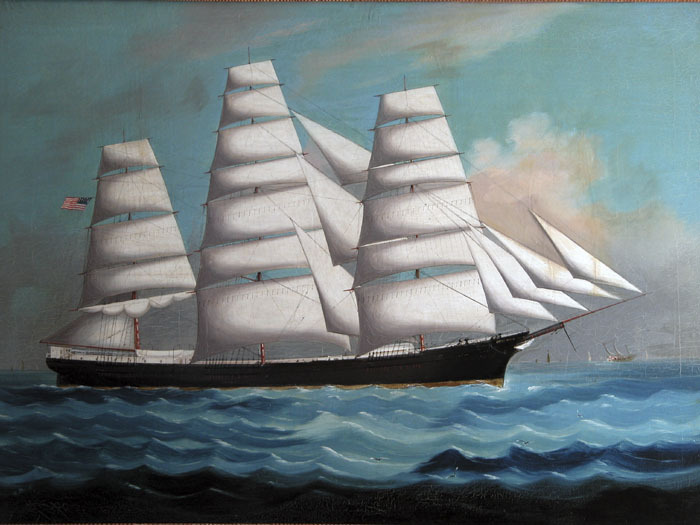 This painting, done by an unknown Chinese artist, was given to Penobscot Marine Museum by the Nichols family.